When the sky is unsettled, it pays to have your camera next to you on the front seat of the car. As I headed down the heart of California on Interstate 5, I had one hand on my Canon 60D and the other on the steering wheel. 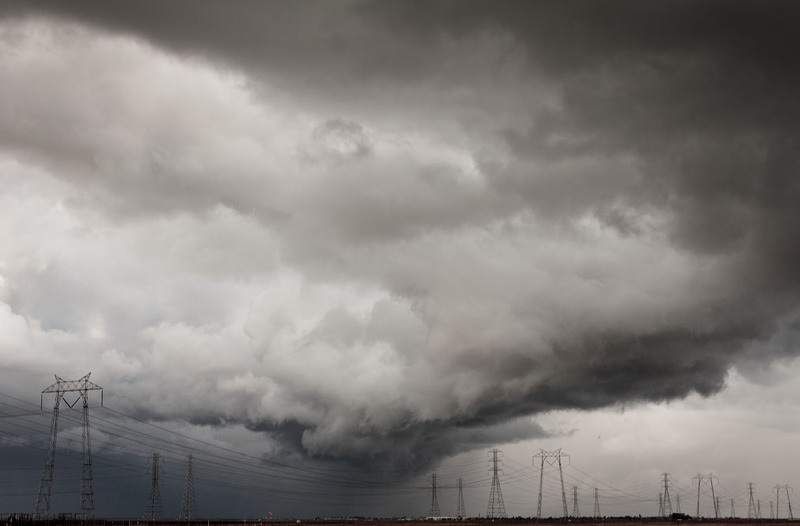 Rain clouds on Interstate 5 captured with a Canon 60D and the kit 18-55mm zoom. ISO 100. Click on image for larger version. Photo by Derrick Story. When this picture presented itself to me, I couldn't resist rolling down the window and capturing it. I recommend viewing the larger version (by clicking on the image) so you can better appreciate the power-line towers that add a nice linear element to the composition. Yes, I do this all of the time. Great idea. Did you capture this in color or b&w in-camera? I captured the shot in color, then pulled down the Vibrance setting to make it more monotone. You never know when you are going to be in the story..
Wow! This is a great capture! It reminds me of the movie "Independence Day" when the alien mother ships were uncloaking (sans fire I guess). Schweet! Derrick, you mean you PULLED over first, THEN took the shot, right? PS: I do not work for the CHP, but just checking anyway.